The most affordable wheel options from the most trusted name in pottery, the Brent IE series pottery wheels are ideal for home studios and for traveling to workshops and demonstrations. 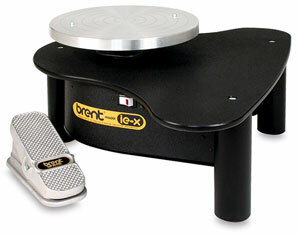 The redesigned Brent IE Series wheels are height-adjustable for use on a tabletop or as a floor model. The wheel height ranges from 13" (33 cm) for tabletop use and ease of storage to 20"–25" (51 cm–64 cm) for use as a floor model. The legs can be adjusted easily by telescoping and locking them into place. A longer 9" (23 cm) power cord attaches the foot pedal to the wheel to facilitate use as a tabletop wheel. Brent IE Series wheels feature a high-density poly tabletop, supported by a rigid all-steel frame. A permanent magnet DC motor provides dependable variable speed control, while a self-tensioning four-groove poly v drive belt holds tight for maximum performance. Series IE wheels include the standard Brent cast aluminum foot pedal, delivering smooth control and a speed range of 0–240 rpm. All IE wheels include a Brent splash pan. Designed for home and studio use, the Model IE-X features a 1/3 HP, 6 amp motor to continuously handle up to 100 lb (45 kg) of clay and a 14" (36 cm) cast, machined wheel head with removable bat pins. The IE-X also includes a forward and reverse switch that offers a neutral "safety" position to assure smooth transitions when changing direction, allowing the wheel head to spin freely in both directions as a banding/decorating wheel. A permanent magnet DC motor provides dependable variable speed control, while a self-tensioning four-groove poly v drive belt holds tight for maximum performance. Included with the Model IE-X are a Brent splash pan, a free How to Throw on a Potter's Wheel DVD, and a free 14" (36 cm) Plasti-Bat. The Model IE-X features a 5-year manufacturer's warranty. It weighs 93 lb (42 kg). 110V. ® brent is a registered trademark. ® brent Built for Life is a registered trademark.® Plasti-Bat is a trademark. This wheel is part of Brent's "Green Series," which refers to Brent products that use eco-friendly materials in the manufacturing process.